"What gear were you in?" "Well I had that little black dress on and my high heels." "I don't remember much about last night as I was totally pissed ,luckily the wife was sober and could drive us home." George Michael had eventually made it home. and Yes......You do need your eyes tested. "So does this mean I haven't passed my test?" "Oh George that reminds me we got a call the automatic garage doors wont be fitted until tomorrow." Polo...The car with a hole. I'd just got in the car with my 5 year old when my neighbour suddenly shouted "YOU'RE A TERRIBLE FATHER!" I thought to myself, who the bloody hell do they think they are!? "Stop the car son"
Accident prone like her oldest boy, Janice also suffered from Parking sons disease. Gordon's main problem was that he just expected too much from his seeing-eye-dog. It's ironic that it will have to go into a garage for repairs. After years of trying the people of Gotham still couldn't find the entrance to the batcave. The first Golf-driver to get in trouble for bashing someone's back door in since Tiger Woods. 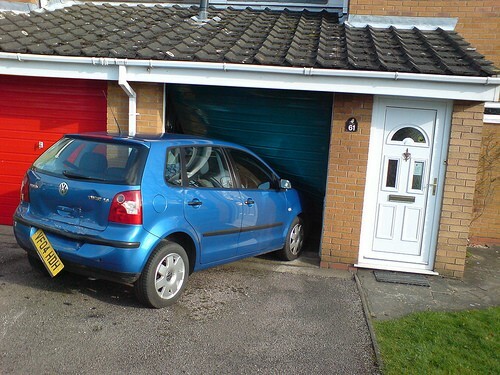 You were only supposed to blow the bloody garage door off! How lucky can you get,it's not my house and it's not my car. "Mavis, about that crash course in driving........"